laundry room, and each year she gets a new one.The past year towel goes into the bathroom as a hand towel. The quality of the linen is excellent, the graphics and printing are clean and crisp. Just got my 2019 calendar and love it! I've bought a linen calendar each year for decades because they make the kitchen look so welcoming. This year I decided to personalize but instead of putting our family name decided on a short message. Looks great! It's going to get lots of compliments. All of these calendar towels were just thrown in the box. Parts were all over. Won't buy from miles Kimball in the near future. Am unsubscribing! I buy one every year, the best linen calendar towel you can get for the price. 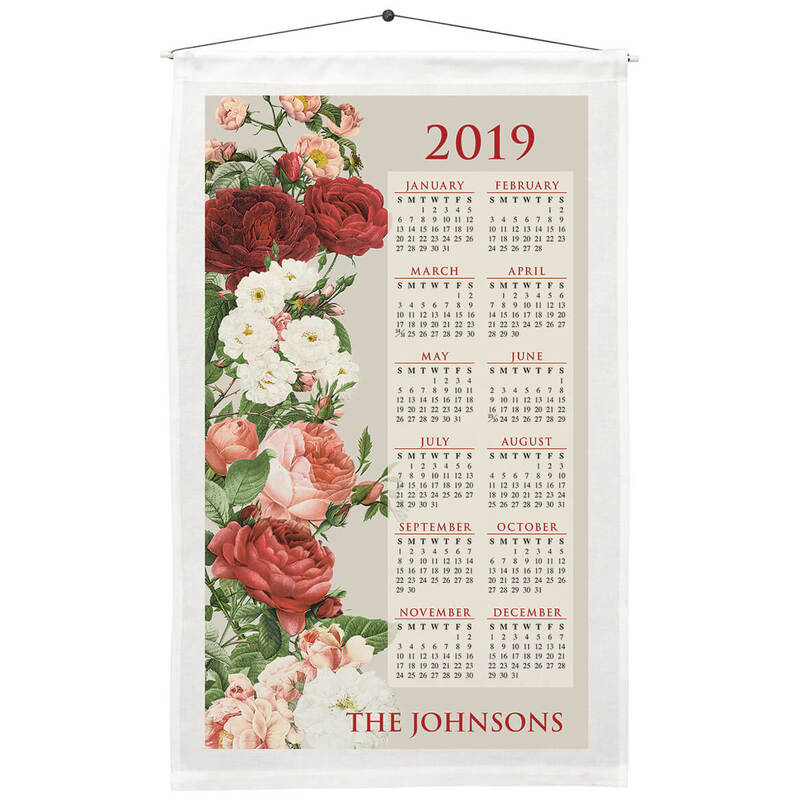 I love linen calendar towels and have been purchasing them for over 40 years. This one is beautiful and I couldn't resist it. we had the same towel and liked.it so we got it again this year. Like towel calendars and I love roses. Beautiful and put our mission statement on it for Assisted Living facility. This is a family tradition over the years to order a calendar from Miles Kimball! love the color and match my kitchen, I wish they bring back the wine bottle calendar. Really love that calendar and got many compliment on it. please think about bring it back. I have purchased linen calendar towels for this friend for over 40 years, and it's hard to find different designs-which I think this one was. For my mother-n-law. I buy her one every year. It's new for our home to have as our yearly calendar. Very Pretty. I put it in a custom frame and hang in our casual dining area. I like this one because the pattern goes all the way down the side so when I hang it later as a kitchen towel over a towel bar, the pattern shows up instead of just the calendar. I have been buying these calendars for over 25 years. Love the way they look in the kitchen and then use as a towel afterwards. Good quality product. Although, I do miss the embroidered name they offered years ago. Get a new calendar towel each year and this is the site to see a good choice to pick from. 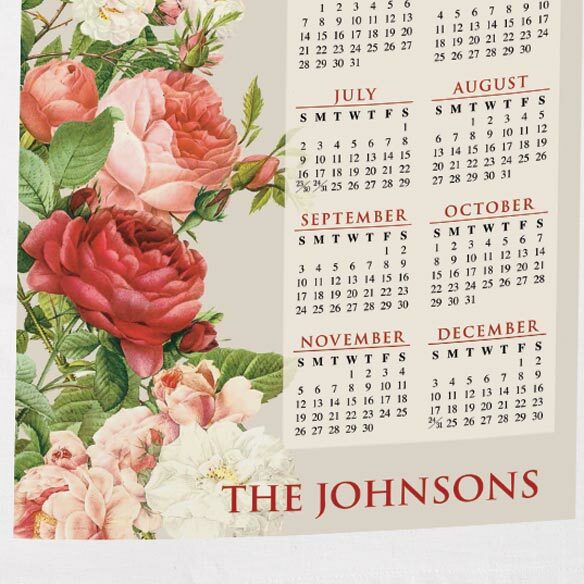 I have ordered these cloth calendars before and I LOVE them. I love Bible verses and personalized items. I get one every year to hang in the kitchen. I have been ordering for years now. My mother has bought these since I was a kid and has then used them as dish towels for years to come. I have continued her tradition and given them to my mom each Christmas as she can no longer find them any local store. Personalized gifts always have special meaning. Especially one that can be enjoyed all year. I get one of these calendars every year for my Mother. I have been buying a family calendar towel from Miles Kimball for years. Always a good selection a great quality. 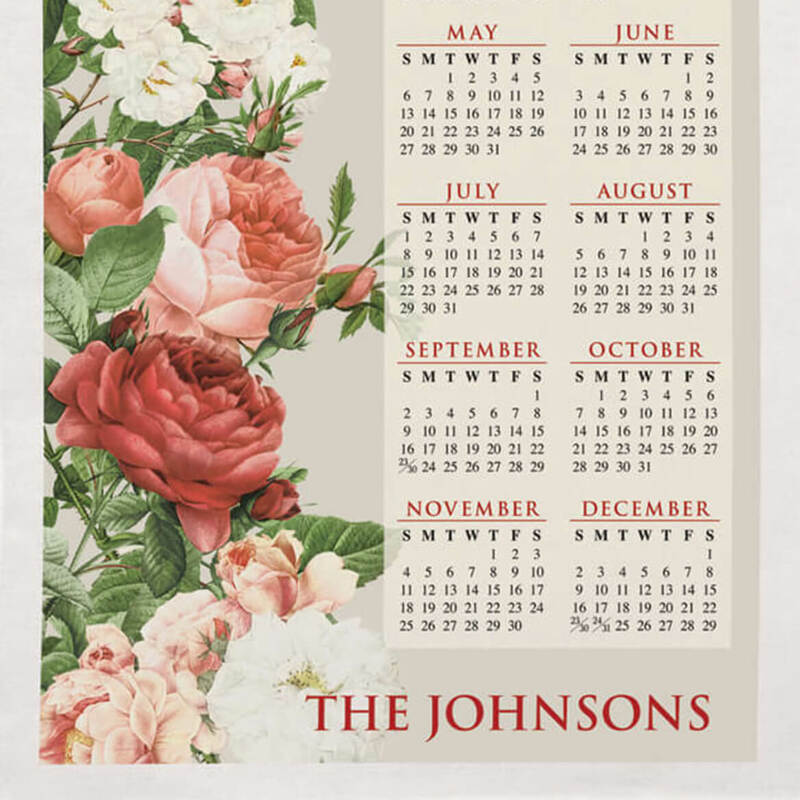 I have always wanted a Calendar Towel and couldn't resist the floral design on the one I ordered. when will 2019 calendars be available? BEST ANSWER: Thank you for your question. It is now available for the 2019 year. We hope this information will be of help to you.